Robert Sim rides along the cliff-top trail on Stage 3 of the BUCO Dr Evil Classic. Photo by Oakpics.com. The young local team of Aidan Connelly and Rogan Smart, racing in the colours of The Bike Shop/SCOTT/Strocam wrapped up the 2018 BUCO Dr Evil Classic in style on Saturday. The pair dominated the event, winning all three stages overall and in the men’s team competition – and while the predominant spirit at the BUCO Dr Evil Classic is one of taking part to enjoy the scenery there were a few riders keen to mix it up with Connelly and Smart. “Paris (Basson) gave us a good run for our money on the downhills, so we played a bit of cat and mouse with him today,” Smart recounted upon crossing the finish line at Cairnbrogie MTB and Trail Park. “It was hard, but fun! We know the trails like the back of our hands and we eventually managed to drop Paris on one of the last climbs and cruise home,” one half of the 2018 race winning team revealed. 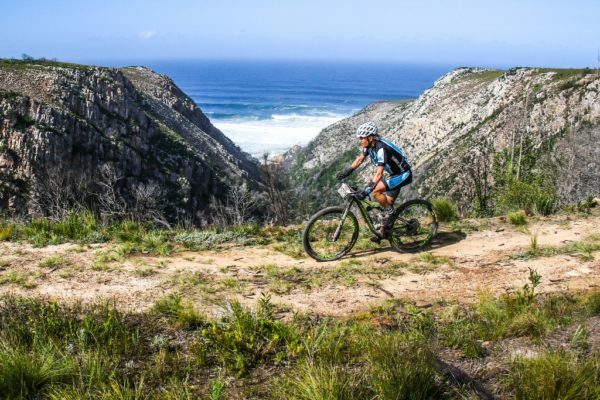 “We have some of the best trails in the country and people must pull in and come ride” Smart said by way of endorsement for the event – to which the entries for the 2019 edition are already open. “It was such a jol” Connelly added. “The singletrack was in sublime condition, the weather cleared up nicely after the clouds this morning and it was just an amazing three days of riding in the Garden Route. Once again I have to say thanks to Dr Evil (Leon Evans) for putting on such an amazing event” he concluded. After two days of gravel roads and jeep tracks, were breath-taking scenery was the order of the day the final stage featured the region’s best singletracks. Starting at Cairnbrogie, where the coastal trails provided views over the Indian Ocean the day took in the deep indigenous Harkerville Forests too as route director Leon Evans saved the best for last. The BUCO Dr Evil Classic’s bike partners SCOTT Sports also saved the best for last when they gave away a 2019 SCOTT Spark RC Comp at the event concluding prize giving. The bike giveaway capped the three days of SCOTT activations which also included e-bike test rides and a helmet swap programme where rider’s old helmets were swapped for new MIPS equipped SCOTT helmets. 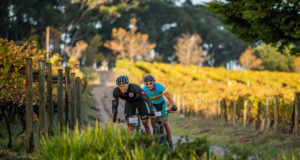 For many of the BUCO Dr Evil Classic field the riding fun did not end in Plettenberg Bay on Saturday afternoon. With the BUCO Karoo to Coast taking place on Sunday a large number of the Dr Evil riders will be taking on the stage race’s unofficial fourth stage – and making use of the guaranteed B Batch start at the largest single day mountain bike event in South Africa. 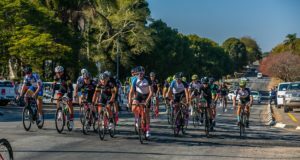 Entries to the 2019 BUCO Dr Evil Classic meanwhile are already open, having opened at 12:00 on Saturday afternoon. Riders who took part this year or those who feel compelled to enter next year’s race, after watching from home as the action unfolded can entre by visiting www.drevilclassic.com. The 2019 event date is set for the 18thto the 21stof September next year. Mountain biking fans can also recap on the beauty of the event by viewing all the photos from the 2018 BUCO Dr Evil Classic on event’s Facebook page Dr Evil Classic. The highlights from the race will premiere on Toyota Cadence, on SuperSport 2 at 19:00. For the full results from the 2018 BUCO Dr Evil Classic click here.